This fabric, a crinkly cotton gauze bought on sale. I was indifferent to it when it arrived. I used it last fall for my Josephine, feeling meh about it as I sewed. And then once the blouse was done, I del l in love with the fabric and wished I had more of it. 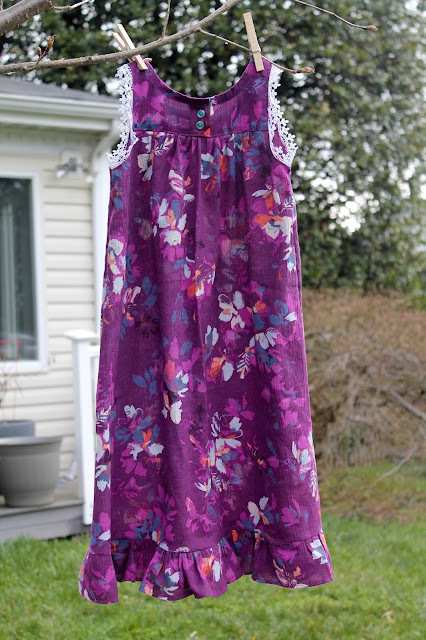 Then my sister asked me to sew a summer nightgown for my niece. 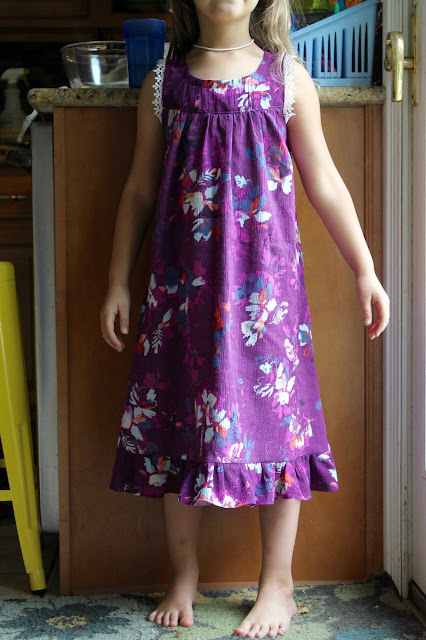 She had outgrown the one I sewed her three years ago. I had just enough of the gauze left for the job. Again I was ambivalent. I thought, this will use up the cut and it is the perfect weight for a summer nightgown. So off I went. Once again, I fell in love with the fabric. Which is serendipitous given that FabricMart just got more in. I'm thinking of ordering another couple of yards. 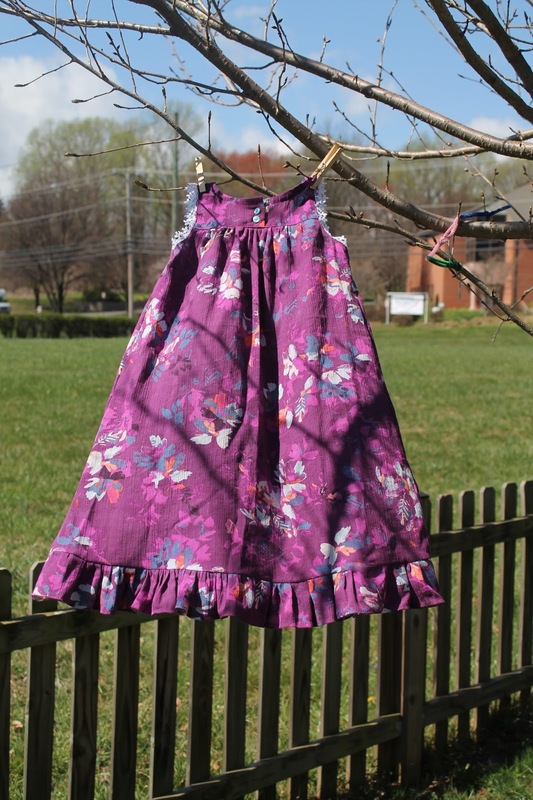 The pattern is Kwik Sew 3423, which I sewed before here and here. I made a size 4 (my niece actually wears a 5 or a 6 but the pattern is roomy). I made a couple of adjustments. 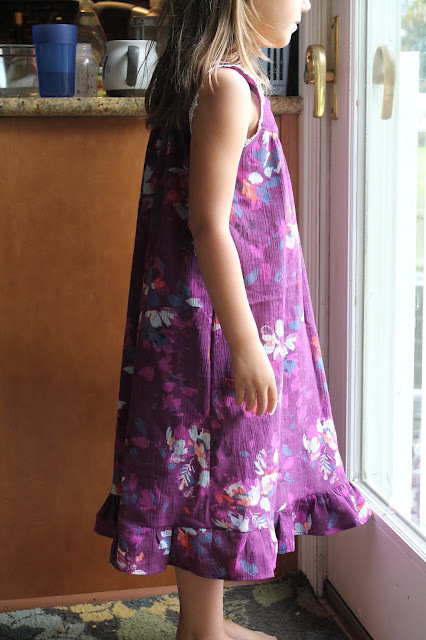 First, the pattern calls for 1/4" seam allowances which I don't like - little girls tend to jump around and put pressure on the bodice/skirt seam. Several of the other nightgowns I made using this pattern ended up with holes there. So now I alter the pattern pieces to allow for a 1/2" seam allowance there. I sewed the seam with my sewing machine, then serged the edges without trimming for a second line of stitching. The pattern calls for finishing the neckline and the armholes with lace edging which is zig-zagged to the raw edge to prevent raveling. I finished the neckline with invisible bias instead. My final issue with the pattern has to do with the button placket on the back. 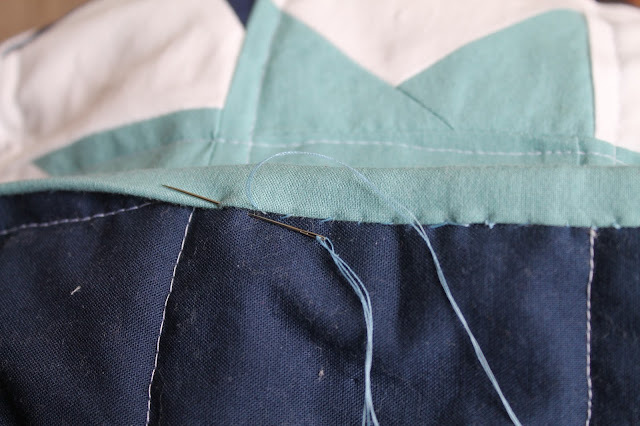 The pattern calls for folding the placket over and then applying interfacing to the edge. The raw edge of the fabric+interfacing is then just left raw. 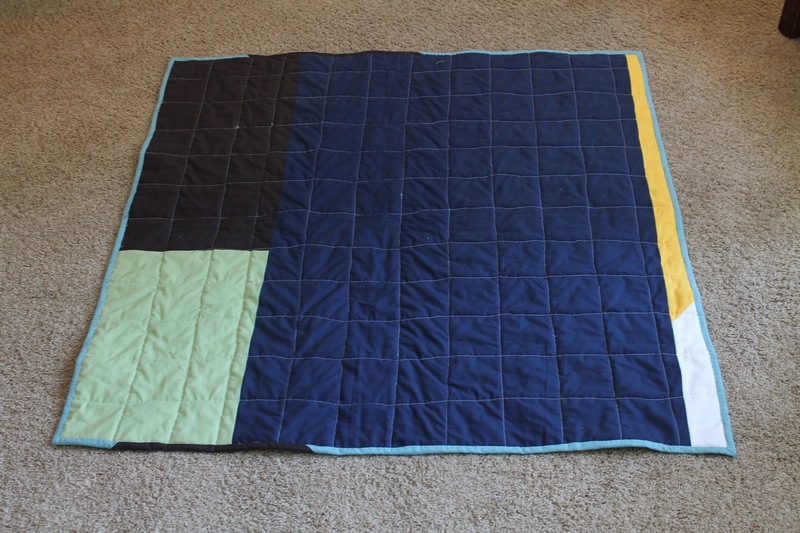 I finished it with my serger but in the future I think I'll add 1/4" to either side so that I can fold the raw edges under and topstitch. I don't know why they don't do that in the pattern. Z agreed to model her cousin's nightie for me before we gave it away. Her cousin is just a tiny bit shorter than she is. 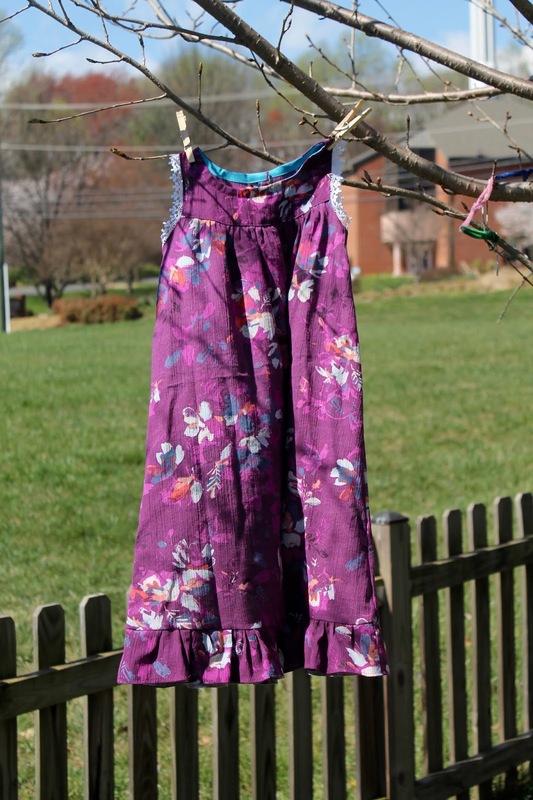 If i had had more fabric I would have lengthened it a bit, but I figure it will fit this year and next. After my husband's stroke, we were positively overwhelmed, in the best way, by the kindness of people wanting to help. People brought food, offered to watch the children, donated leave, sent gifts and visited J in the hospital. One of J's colleagues did all of those things and also sent real, hand-written snail-mail letters to J while he was in acute rehabilitation to lift his spirits and give him something to look forward to. Those letters were such a small thing but they meant so much to J. I think they helped him feel like he had not been forgotten or left behind. I felt, and still feel, so grateful to the letter-writer. So when he recently became a father, I wanted to return part of his kindness by making something very special for his little boy. J has been back at work for nearly two months now and it is going really well. He is walking and driving and providing, and we are finally seeing some movement in his previously paralyzed left hand. He actually wrote his name with it this week! Considering that he is only 10 months out from his stroke, this is pretty amazing. 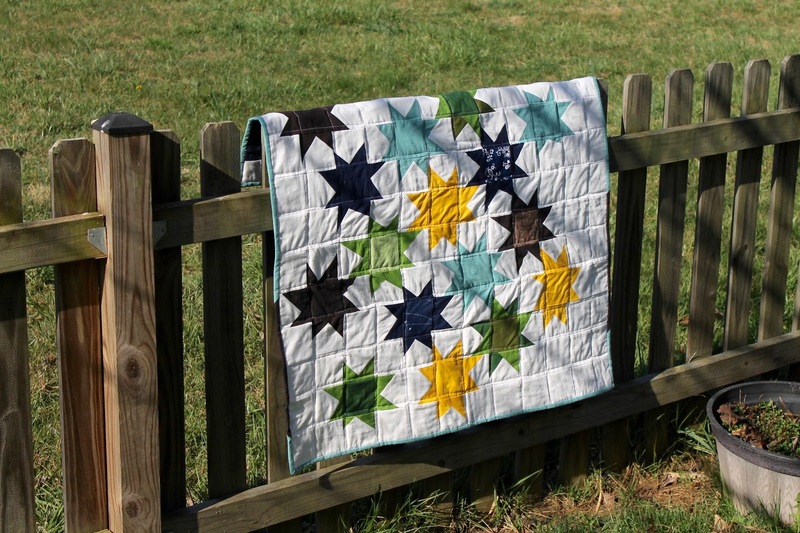 So ... the quilt. 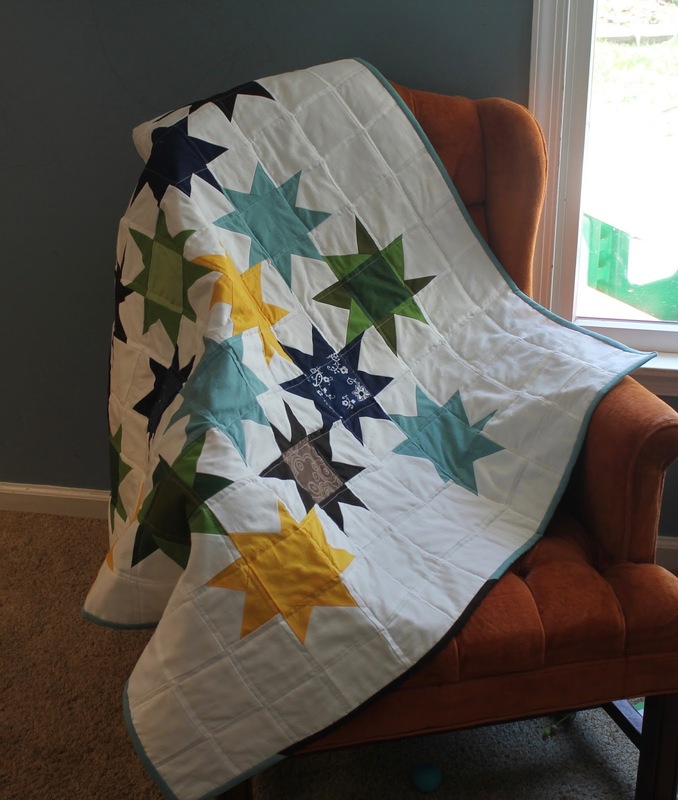 This is actually my second quilt, made on the heels of my first. The first one is still unblogged as it has yet to reach its final destination - but it will be up soon. 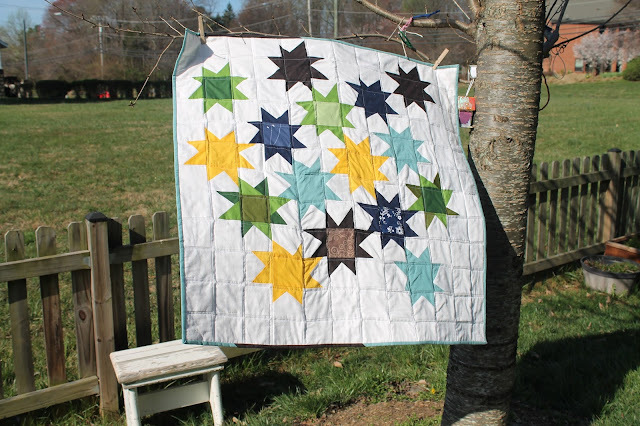 This one is a wonky star quilt, based on Elizabeth Hartman's Sparkle Punch quilt. I made it using only fabrics from my stash (though I did have to buy the batting). I found the piecing fun and relatively quick, but the quilting was difficult. I think maybe my walking foot doesn't work properly - I don't ever find that it evens out the feed discrepancy of the upper and lower fabrics as much as I think it should. It's also possible that my expectations are too high. In any case, I was completely unable to keep my stitch length uniform. 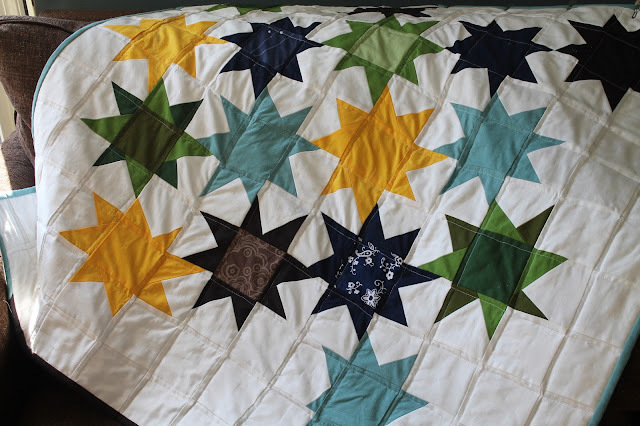 This is not a large quilt - about 40" square - and I tried really hard to support the weight of the quilt uniformly, but it still got stuck under the presser foot quite often because I wasn't supporting it well enough. This was kind of disappointing because I think I have caught the quilting bug and I'd really like to attempt something larger ... but I am afraid to try something bigger than this little baby quilt. So if anyone has tips, I am all ears! 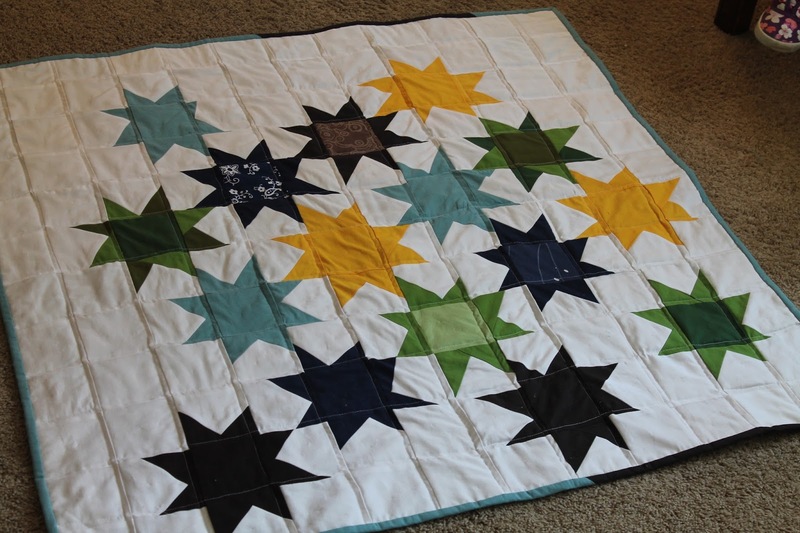 The back is pieced from leftover fabric from the quilt. 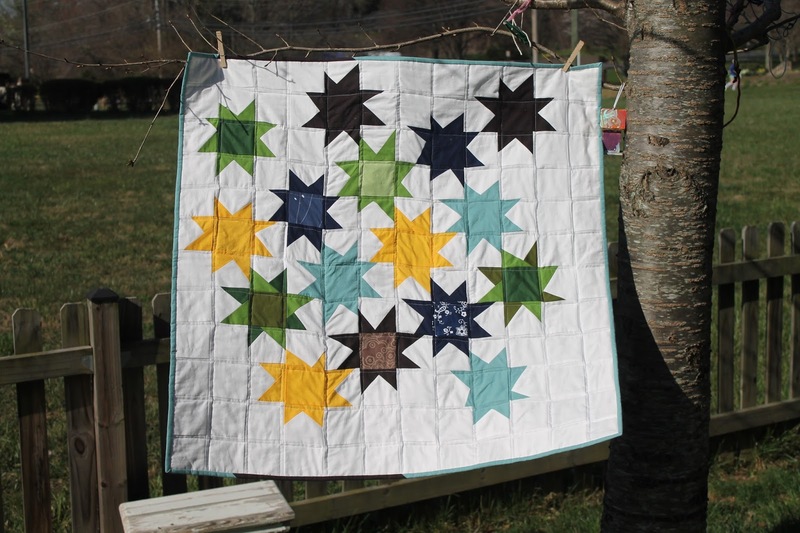 I don't love it, but I was trying to work with stash and my travels around Internet quilt-land show that this is a common way to make a backing. My favorite part of the whole process had to be the binding. I hand-sewed it on, and I found it thoroughly satisfying. I enjoy a little hand-sewing at the end of a project. I know a lot of people hate it, but I don't mind an hour's work finishing something in front of the TV. That said, I enjoyed sewing on this binding so much more than turning up a hem. 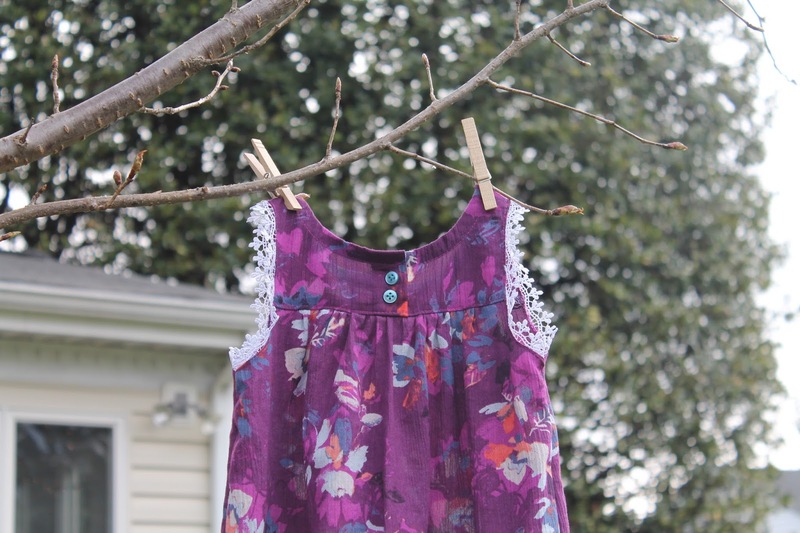 It is transformative in a way that adding buttons to an otherwise completed garment is not. A shirt without buttons still looks like a shirt - it isn't going to look that much different once the buttons are on (unless, I guess, they are crazy loud novelty buttons). 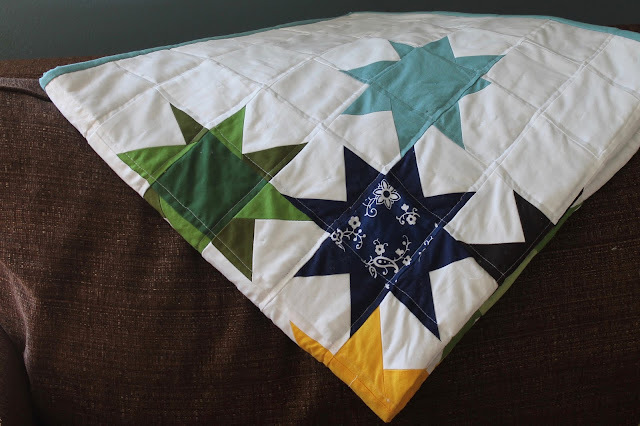 But after you've quilted a quilt, but before it is bound, it still looks very unfinished and very different from the way it will look when that excess backing is cut away and those threads are trimmed. 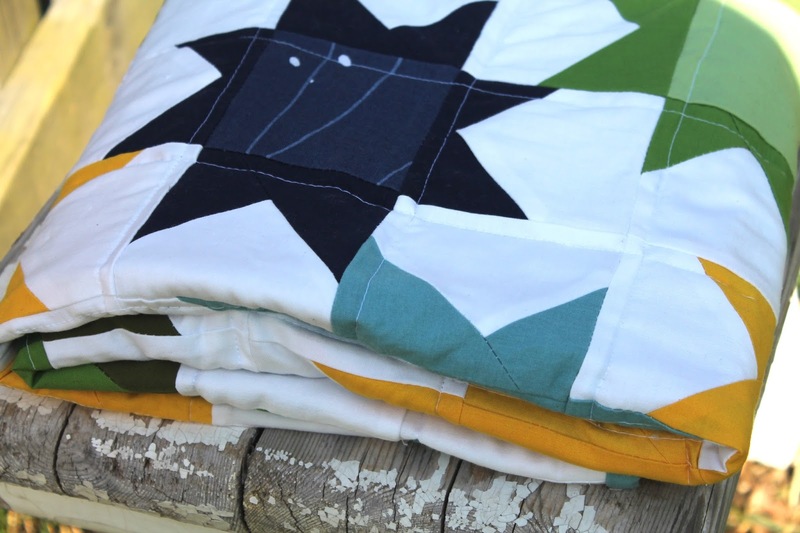 Sewing the binding on wraps up that mess in a neat little package and all of a sudden you have yourself a quilt. It is so cool! So, there you go. 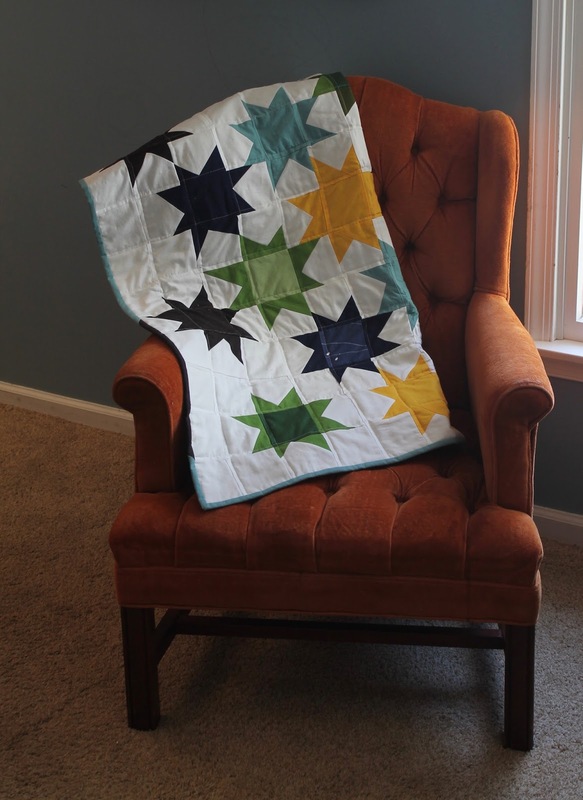 Quilt #2. I'm already dreaming about #3. But I just got some new clothing patterns in the mail so I had better go sew some pants or something. I have had a hard time making up my mind when it comes to social networking. I've been in and out of Facebook a couple of times now (current status: out, I find I'm a lot happier that way). I'm on Ravelry but mostly use it as a knitting notebook rather than a social outlet. 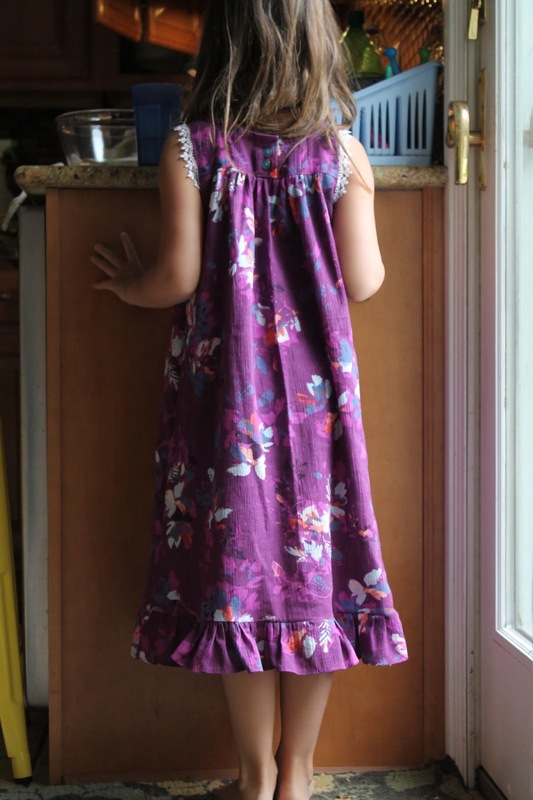 When I started posting my sewing projects to Flickr in 2011, I was very shy about showing my kids' faces. And I was the same way when I started this blog - I didn't even use their names. So for the last five years or so, a fierce debate has been raging in my head. Do I go the route of some of the blogs I follow, which feature lovely photos in which you never see a child's face? Probably Actually, S is for Sewing and Nest Full of Eggs come to mind. Or the route of other bloggers who draw you in with beautiful photos of their kids and funny stories to illustrate their temperaments? (See Five and Counting, Stitched Together and Inder Loves Folk Art). The latter blogs drew me in, made me feel welcome and almost part of the family. I got to know them and I loved it. I wanted, so much, to share a little bit of our life, to participate in this community the way many others do, to feel a little less anonymous. So I began using my children's real names on the blog and started posting photos featuring their faces. I did the same on Flickr. And then one day, maybe six weeks ago, I received a notification that someone whose name I did not recognize had favorited a couple of my photos on Flickr. This happens from time to time. I usually click through to see who they are, have a browse through their photos or favorites to get a sense of whether they are interested in sewing or something else. If it's "something else," I will usually block them, but of course I am aware there may be others interested in "something else" who are looking at my photos and never make themselves known. The man in question was interested in a few photos of Gabriel wearing swim trunks I had sewn last year. I opened his favorites with a sinking feeling that was confirmed when my eyes met with row upon row of photos of little boys - wearing little or nothing. I wanted to throw up. I immediately blocked him and set about fiddling with my privacy settings. It's not that I did not know that this was a possibility. In fact, the photos in question were headless because I was uncomfortable posting identifiable photos of my son in his swimsuit. So I'm not stupid. But even so, seeing photos of my little boy in that line-up ... it was an awful kick in the stomach. So I thought about it. For weeks. And ultimately I have decided that I don't want to stop blogging. I don't want to leave Flickr. I don't want to go Internet dark. (In fact, I even joined Instagram last week - mostly because no one is on Flickr anymore - find me here). But I just don't feel totally comfortable posting identifiable photos of my kids online - honestly I am not sure I ever was fully comfortable with it. So from now on I will mostly be posting headless photos and the like. As for these headless shots, they are both Oliver+S Playtime Leggings in jegging fabric - two different fabrics bought at different times at different stores and I don't remember any of the details. Z's are a size 5 with an extra inch of length and N's are a size 5 with 4" extra. She probably only needed 3" extra but I accounted for shrinkage and growth; I need these to get us to summer at the least. 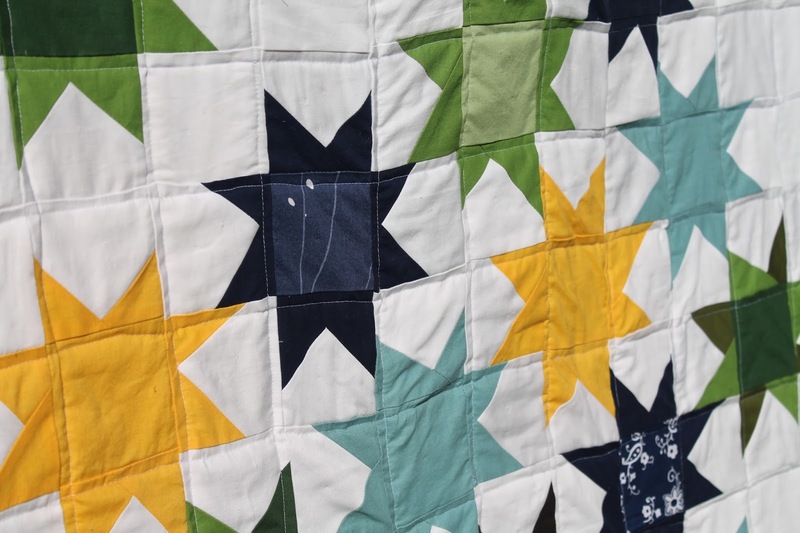 My love for this pattern is already well documented (here, here, here, here, here, here, here, here, here and here), so I guess there isn't much more to say about that!